Tablet PC: The Next Generation? "For those of you who are not quite ready to part with your classic G3 FireWire PowerBooks, a.k.a. Pismos, there's now yet another reason (or good excuse) to hang on to them, along with some other vintage PowerBooks, at least for a while longer. "If you've noticed lately (and even if you haven't) that your display isn't as bright as it once was - at five years old, depending on use and excluding the usual exceptions, it's somewhere between 10% to 30% dimmer than when new-then it's time to replace its backlight with a new one. "A new backlight with installation from IDParts, Inc. will cost you $120. While that will certainly put the old shine back on the screen, along with a smile on your face, by itself it's not going to provide you with the kind of brightness that you can obtain from a new PowerBook. But now thanks to the skilled and innovative technicians at http://www.idparts.com/ you needn't suffer the pangs of brightness envy any longer. "Currently for a total cash outlay of $345 (not including shipping charges) you can not only have a brand new backlight installed in your Pismo, bringing it back up to specs, but you can also take advantage of the newest display technology, a remarkable BEF & AR/AG film combo upgrade (more on the meaning of that shortly) that will provide it with a stunning increase in brightness along with a reduction in reflectivity and glare." "EVDO is hot! Apple provided support for the PC 5220 EVDO card, however, Verizon is only pushing the Novatel V620 these days and the PC 5220 isn't available. This article will describe how to get the Novatel V620 to work with your PowerBook. "For users not comfortable following these technical steps, we will be building a Mac OS X installer that performs these steps for you. It should be available next week. We can also remotely perform these steps, if your PowerBook has a fixed IP and is accessible over the Internet, contact us for more info." PR: Seagate Technology is expanding its line of notebook hard drives with the industry's highest capacity and performance for applications ranging from high-performance mobile workstations to mainstream laptop computers. Combining a wide range of spin speeds and capacities up to 120 GB, the 2.5" Momentus family delivers ruggedness, power-thrifty design and whisper-quiet operation. Highlighting Seagate's notebook product line are 7,200- and 5,400-rpm models that provide the highest capacities available - 100 GB and 120 GB, respectively - to help meet growing demand among mobile users for notebook computers with greater performance and storage capacity. "People on-the-go need notebook computers that deliver desktop PC performance yet can withstand the rigors of travel and extend battery life," said Jeff Loebbaka, Seagate vice president of Global Marketing. "Others are willing to settle for lower performance and capacity in exchange for lower cost. Seagate is meeting all these needs with a family of Momentus drives that combine the widest range of spin speeds and capacities with the highest levels of reliability and power efficiency." "As notebook PCs displace desktop PCs in the workplace, end users increasingly will demand desktop PC capabilities in notebooks," said John Buttress, IDC's research manager for hard drives. "Currently, the market for 7,200-rpm notebook drives is a niche market, but it is growing, and the market for 5,400-rpm drives already is growing rapidly. The market opportunities for these high-performance drives in notebook PCs also include requirements for higher capacities. Companies like Seagate that combine these capabilities with lower acoustic and power consumption levels will be well positioned in these growing segments to gain market share in the future." Not just for notebooks, Momentus features a tough design that also makes the drives ideal for CE devices, printers, copiers, non-mission critical blade servers, external storage arrays and other environments where systems are jostled or subject to high levels of vibration. Momentus drives can withstand up to 900 Gs of nonoperating shock and 250 Gs of operating shock to safeguard drive data. Momentus hard drives are also highly power efficient, allowing notebook users to work longer between battery recharges, and are virtually inaudible to users thanks to Seagate SoftSonic fluid-dynamic bearing motors. Momentus 7200.1 - Offered in capacities up to 100 GB, Momentus 7200.1 delivers 7,200-rpm spin speeds for high-performance mobile workstations, non-mission-critical blade servers and small form factor PCs. Momentus 5400.2 - Available in capacities up to 120 GB, Momentus 5400.2 brings 4,500-rpm power efficiency to 5,400-rpm drives. The drive's high performance, low power consumption and robust design make it ideal for mainstream notebooks and tablet PCs. The hard drive also is a good fit for industrial applications such as printers and copiers. Seagate offers Serial ATA as an option for Momentus 5400.2 and Momentus 7200.1 drives to deliver fast 1.5 GB/sec interface speed and NCQ (Native Command Queuing), making the drives a great fit for high-performance notebook PCs. Momentus 4200.2 - Offered in capacities up to 120 GB, this drive is ideal for low-cost notebooks and external storage. PR: MCE Technologies brings you the world's first slot-loading optical drive upgrade designed for the tray-loading white iBook G3. Simple, inexpensive, and elegant - like your iBook. Priced at $199. Is your iBook G3 tray-loading drive on its last legs or no longer offers you the performance or capabilities you want in order to take full advantage of your digital lifestyle? Look no further - MCE Technologies has made its highest performing slot-loading CD and DVD burning drive available for the iBook G3. Replacing your iBook G3's original tray-loading drive, the MCE slot-loading drive allows you to watch DVD movies, play audio CDs, as well as burn blank CDs and blank DVDs at the highest speeds possible. Compatible with iTunes and recording at 24x to both CD-R and CD-RW media and at 8x to both DVD-R and DVD+R media the MCE 8x Internal SuperDrive upgrade actually brings the iBook G3 on par with even the fastest drives Apple offers for their Power Mac G5 towers - even more amazing is that the MCE 8x SuperDrive upgrade has Double Layer support which means you now have the ability to record up to 8.5 GB of data on a single side of a Double Layer DVD. The additional storage capacity of the DVD+R Double Layer disc enables you to record up to 4 hours of DVD-quality video or 16 hours of VHS-quality video, without the need to turn over the disc. You can now archive up to 8.5 GB of computer files on a single disc, which almost doubles the storage capacity compared with the 4.7 GB for the single-layer DVD-recordable discs currently available. The new MCE 8x Internal SuperDrive Upgrade is compatible with 12" and 14" Apple iBook G3 (Tray-Loading/Dual USB) Systems. The Double Layer DVD+R system uses two thin embedded organic dye films for data storage separated by a spacer layer. Heating with a focused laser beam irreversibly modifies the physical and chemical structure of each layer such that the modified areas have different optical properties to those of their unmodified surroundings. This causes a variation in reflectivity as the disc rotates to provide a read-out signal as with commercially pressed read-only discs. Did you get all that?? It just means that there are two recording layers inside the DVD instead of just one... two layers means twice the recording capacity! Now wasn't that easier? Not every disc is created equal. The MCE 8x SuperDrive Upgrade for iBook G3 implements an onboard liquid crystal tilt/thickness compensator... the first time ever in a portable form factor. This cutting edge technology provides accurate, reliable read and write performance with a variety of disc characteristics, even with irregularly curved or thick / thin media. This technology is also effective in recording DVD+R double layer media. The MCE 8x Internal SuperDrive Upgrade must be installed either by MCE Technologies or one of it worldwide Authorized Upgrade Centers. MCE Technologies charges a $39 installation fee which includes two-day return shipping. PR: Wegener Media's Pismo G4/550 MHz upgrade offers low power consumption and excellent heat dissipation. With the 1 MB L2 cache level at 250 MHz, the performance surpasses all of the early titanium G4s, and with this low-power consumption design, you'll see longer battery life, more horsepower, and a cooler running processor than you have ever had before. PR: Wegener Media offers the Avanti 400 G3 upgrade for WallStreet. Kit includes processor, installation guide, and return label for shipping back old card. PR: The Kinesis NoteStand, a Dutch ergonomic design by Wolf C, made from ultra thin & lightweight hi-tech composite aluminum, provides an elegant, sturdy, yet incredibly lightweight adjustable support for your laptop computer. The NoteStand positions your laptop screen closer and at eye level, improving visibility and reducing the hunched posture usually created with notebook computers. The NoteStand is also great for keeping your laptop cool. Use it at home, in the office, or while you travel. The NoteStand instantly folds-up into a lightweight and ultra thin shape - storing conveniently in your briefcase. The NoteStand is an attractive alternative to clunky and heavy plastic notebook risers. For office use, connect your regular full size (preferably ergonomic) keyboard and mouse to improve comfort and productivity. When working away from the office, use compact ergonomic input devices such as the Kinesis MiniType keyboard and a compact wireless mouse available from Kinesis. Conserves desk space: footprint as little a 9.5" x 9.5"
PR: The Laptop Lap Desk features improved laptop ergonomics & cooling. Improve your comfort and productivity by using an external mouse when using your laptop in your lap. Using an external mouse instead of the integrated mousing feature on your laptop promotes neutral wrist postures. This can help reduce the wrist strain commonly associated with laptop computer use. 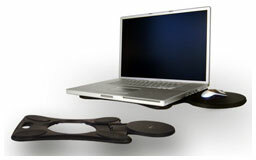 The lap desk insulates your legs and clothing from annoying and uncomfortable laptop heat. PR: A Lapthong is a designer cover that protects your laptop from dust and scratches. Of course, it adds a sense of style to your PowerBook. 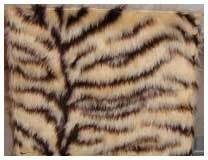 These laptop covers go on the top of your laptop. It can stay on your laptop even when it is turned on - a great way to stylishly protect the top of your laptop from dust and scratches. The tiger cover looks great and feels great. You'll want to pet the cover every chance you get. PR: Designed for any way you work - sleek, internally armored soft case functions as a top-loader or in unique stay-on mode, the svelte tekmõd features the protection of a bulky bag, with the portability and versatility of a slim brief. Upgrade your notebook's durability, functionality and style without bulking it up - constructed from top-grade 1680D ballistic waterproof Nylon, and featuring embedded impact-absorbing 1.6mm high-density Polyethylene armor plating throughout. Heavy-duty, removable shoulder strap lets you sling the tekmõd over your shoulder, or carry it like a brief with its contoured rubber handle. tekmõd's unique stay-on configuration allows you to work right out of the case with unrestricted port, slot, drive and storage pocket access! A convenient flip-out stand provides the perfect degree of notebook inclination for ergonomic keyboarding, and an internal suspension system cradles and lifts the rear of the notebook to allow ample ventilation and air circulation to ensure cool running. tekmõd's expanding pockets and pouches completely flatten when empty, yet expand to accommodate your ancillary gear, documents, wallet and keys. Work anywhere with lightweight style and timesaving confidence - tekmõd was voted an "Editor's Choice" and received the highest rating in Laptop Magazine's roundup of the best notebook cases. Experience the joy of getting down to business quickly without fumbling with your bag, and doing it in tekmõd's full-protective style! Fits any user, in any situation - tekmõd accommodates you. Main compartment protected by shock absorbing plastic and closed-cell foam armor. Ergonomic keyboarding riser stand deploys in seconds. 1680D ballistic Nylon exterior is waterproof and durable. Open sided design and rear flap provide full port, slot and drive access. Dual elastic corner retention straps keep notebook firmly located. Contoured rubber handle and removable, well-padded shoulder strap. Top-grade YKK zippers and carabiner style hardware throughout. PR: IDParts stocks replacement LCD displays for most current laptop, notebook and subnotebook computers, including Apple laptops. LCD's are priced 20% to 50% below competitors. PR: The iSweet is designed specifically for Mac laptop users and includes two cases, FireWire cable and additional connectors. High Quality: Image quality of a webcam is affected by many factors; the two most common issues associated with poor imaging are what inspired the manufacturers to design a webcam that succeeds where others fail: throughput and imaging. The iSweet features a SONY 1/4" Color CCD and is connected via a FireWire connection, allowing significantly higher transfer rates - and for anyone with a good connection to receive a great video feed. High Speed: Unlike USB connections, the maximum transfer rate of the iSweet is 400 Mbps. Forget about time lapse photography; with the iSweet your image won't miss a beat. Great Design: All components of the iSweet are designed for use. The size of the iSweet lets you take it anywhere. The included hard and soft cases let you decide how far the trip might take you. Easy to Use: Plug and Play simplicity gets PowerBook and iBook users going right out of the box. 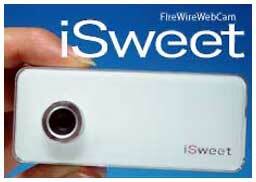 iSweet FireWire Web Camera sells for $129. "First it was the slate. Then it was the PC-Tablet convertible. Now it's a mini-Tablet that can do everything that a traditional Tablet PC can do, plus store electronic books, that could end up as the new gadget on which Microsoft is betting to further Tablet PC momentum. A prototype of a new device - described by sources as a type of hybrid Tablet PC/eBook - has been making its way around the Microsoft Redmond campus, according to sources. The mini-Tablet, which measures about six inches by eight inches and features a digitizer, is just one of a number of new Tablet form factors expected to debut in the coming months."